IntDPD: International Platform of Movements of Direct and Participatory Democracy: [Brazil] The Participative Democracy tool named "National Conferences"
[Brazil] The Participative Democracy tool named "National Conferences"
One of the most interesting participatory tools in Brazil and adopted since the last term of President Lula is the delivery of part of the democratic control directly to citizens in the form of "National Conferences". The National Conferences are joint meetings between representatives of the State and Civil Society seek and build consensus on a certain policy. In fact, this format was not an invention of Lula da Silva but a reissue of a model used in Brazil for the first time in 1940 by President Getulio Vargas when he opened the first dedicated to the topic then Public Health. Not being your "inventor", Lula, certainly had the great merit of developing this tool Participatory Democracy: from 115 National Conferences nothing more or less than 74 were made during the eight year term of Lula da Silva. The current model involves the convening by one of the ministers of the Government through an "Administrative Act" and after a series of meetings and discussions between citizens Crusaders and their agents and representatives of the Federal Government and States are presented recommendations to the Federal Government. If approved, the resolutions of the National Conferences become federal decrees signed by the President. 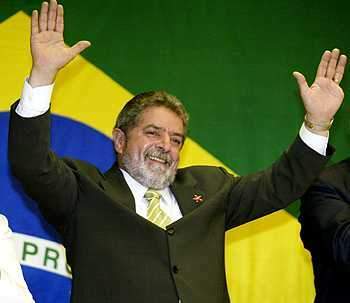 In the eight years of Lula Administration over six million Brazilians participated in National Conferences, giving a great example of active citizenship to all democratic nations of the world. The themes were as comprehensive as Gender Equality, the Domestic Abuse or Violence in rural areas. The National Conferences today represent a form of Direct Democracy and brought to the political segments of the population that have traditionally been alienated from her, either due to low levels of education, either by traditional low female representation in Congress in Brasilia. The National Conferences are part of what is now the Dilma administration calls the "National System of Participation" and has the potential to grow, increasingly involving citizens in political decision-making at local, state and federal. Today, in its current state, has a lot of influence over important legislation produced this great country Lusophone and the application model of Participatory Budgeting in Porto Alegre are putting the country at the forefront of developing participatory forms that contribute to the regeneration of Democracy .